Our newest security bulk linen truck, the 72S/SSL6 comes with rounded corners and larger inner ribs, combined with a recessed front door and top lid is especially suited for commercial laundries. The split top lid in hinged in the center. This new ergonomically designed model has superior strength, durability, versatility, and security. It has an all new lockable, rotationally molded roof and front cover to prevent theft. The cart is leakproof so it may be transported and left outside. Ideal for commercial laundries, hospitals, nursing homes, resorts, health clubs, and the food industry. 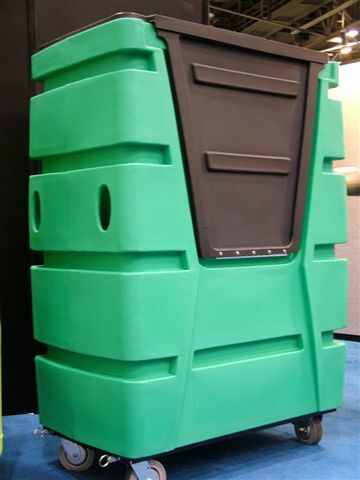 Choice of 17 different colors for body of cart, or choose our recycled polymer for cost savings. Top lid and front door are black.